A webhook is a way for one application to share data with another application. ONTRAPORT can automate sending Webhooks in Campaigns and in legacy Sequences and Rules (where it is known as a "Ping URL"). ONTRAPORT can also receive a webhook from other applications, or even from itself. Webhooks can leverage third party integration platforms such as Zapier and allow you to push ONTRAPORT data into hundreds of other applications. Many applications provide an "endpoint" or webhook URL you can send data to directly, without the use of a third party integration platform. Every webhook needs a webhook URL to receive the data, and the data itself. Different applications will also require transaction details to be included such as an API key and an application ID. 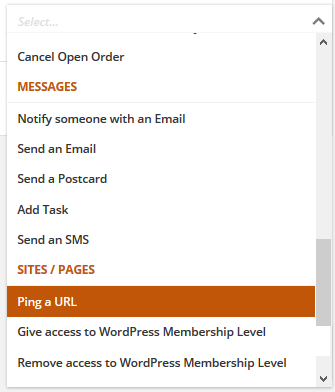 You will insert the webhook URL into one field, and then format the data in the Post Data section of the webhook. The use cases below will show you how this is done. You will need to obtain an API Key and Application ID to send data to ONTRAPORT using a webhook. Navigate to Administration > Integrations > ONTRAPORT API Instructions and Key Manager and create the API Key and Application ID. Copy the keys to a text file for use later. If you are sending a webhook from ONTRAPORT to another application, you may need to have an application ID number or API key from that application. 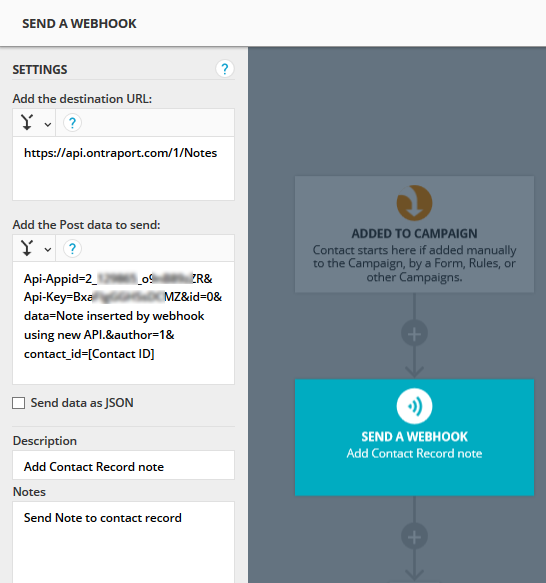 To send a webhook in a Campaign select the Send a Webhook element from the Advanced tab. In this example we will show how to send ONTRAPORT information using merge fields to another application. The other application allows us to create a contact record by sending the first name and email address. The application requires us to use the label "First_Name" for the first name data, and "Email" as the label for the email data. In the Add the destination URL section of the Settings enter the other application's webhook endpoint URL. You will obtain this from the other application. 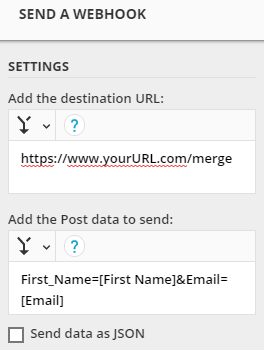 In the Add the Post data to send field you enter the information you want to send to the other application. You will use the label the other application needs to identify the data, an equals sign, and select the corresponding ONTRAPORT merge field from the drop down. To add the next label, equals sign and merge field we use the ampersand symbol "&" to join the data statements. Test the action of the Send a Webhook element by sending a test Contact through the Campaign and verifying that the data shows up in the other application. To use webhooks with Zapier, see our article on Integrating with Zapier. In this use case we want to add a Note to the Contact Record from within a Campaign in ONTRAPORT. This can be used in lieu of someone from your team manually opening the Contact Record and adding the note. Obtain an Application ID and API Key in Administration > Integrations > ONTRAPORT API Instructions and Key Manager. Copy the values to a text file to be used later. Add the Send a Webhook campaign element to the Map. Replace the "1_111111_11111111" with your App ID number obtained in step 1. Replace the "222222222222222" with the API Key number from step 1. Replace the text "Note inserted by webhook using the new API." with the text you want to add as a Note. When the Contact lands on the Send a Webhook element ONTRAPORT will create a Note with the text "Note inserted by webhook using new API." in the Contact Record.